Interesting Facts - Wild With Gabriel! Black Bears are amazing animals and I am continually learning more and more about these fascinating creatures. As I've studied Black Bears I have learned there are a lot of regional variations in their behavior so some of the information you find here will be specific to the mid-atlantic region. What are Baby Black Bears Called? 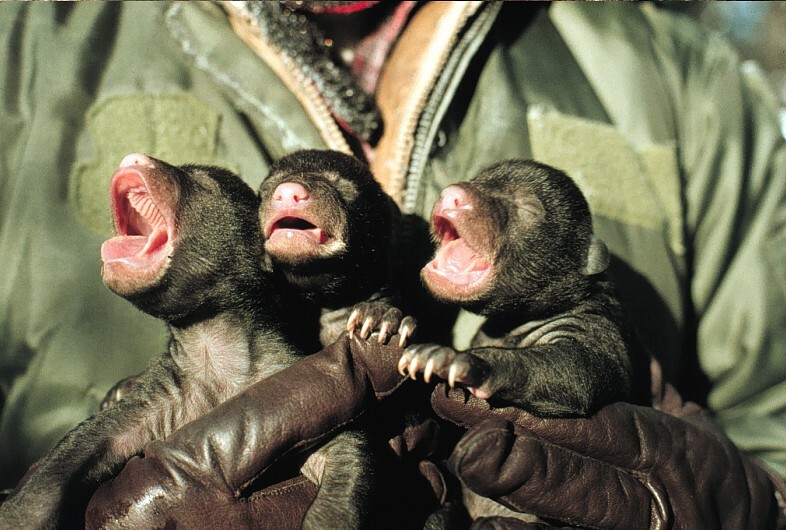 Female Black Bears are called "sows", males are called "boars", and babies are called "cubs". When Are Black Bear Cubs Born? Black Bear cubs are born in their mother's winter dens in January and February. They weigh 8-12 ounces at birth and are furless with their eyes closed. They emerge in late April weighing 4-8 pounds, at which time they are furry and have their eyes open. One interesting fact that not many people know is that although Black Bear mating season is in June and July and cubs are not born until the winter, true gestation is only ten weeks long. I know what you are thinking, "Gabriel doesn't know how to do his math! ", and while I can't boast to be a genius mathematician the truth is that after mating, the fertilized eggs undergo delayed implantation. The eggs form blastocysts that suspends further development until the Sow enters the den in the fall, and the blastocysts implant in the uterine wall to begin their rapid development. Female bears will often mate for the first time when they are 2-3 years old, giving birth the first time when they are 3-4 years old. They reach full size by 5 years of age. Male Bears, referred to as Boars reach sexual maturity at approximately 5 years of age, but will have to compete with more dominant boars in the area for an opportunity to mate. Males reach full size at approximately 8 years of age. How Long Do Black Bears Cubs Stay with their Mothers? Female Black Bears have cubs every other year. Black Bear cubs generally remain with their mother for the first 16 months. She sets them out on their own in late May or early June of their second year so that she can mate again and prepare to raise her next litter. When a mama bear sets her yearlings on their own it is often referred to as "the Boot". In my book "My Life With Black Bears" I share my experience of witnessing this firsthand. How large are black bears? Adult male Black Bears are larger than females and are sometimes more than double the size. Adult female eastern Black Bears generally weigh 125-300 pounds. Adult males generally weigh 250-400 pounds with some even topping 600 pounds. Eighty percent of a Black Bear's diet is vegetarian. The remaining twenty percent of their diet consists of larvae, roadkill, winter-die-off mammals and White-tailed Deer fawns in the spring. When are black bears Most active? Black Bears are active at all times of day and night, but especially during the hot summer months they prefer to be active closer to dawn and dusk. Animals active at dawn and dusk are called "crepuscular". Eastern Black Bears do not truly hibernate. Their heart rates do not slow down as much as those of other true hibernating animals. They are also more active in wintertime than true hibernating mammals if it gets warm or if food becomes available. "Winter lethargy", "semi-hibernation", and "winter denning period" are more accurate terms. Are Black Bears Totally Black? Black Bears come in more colors than any other North American mammal. They can be black, ​brown, cinnamon, blond, blue-gray, or white. However, most of these color forms occur in western and northwestern North America. In the east almost all Black Bears are black colored. Is it Possible to identify individual black bears? Black Bears vary in size and coloration and facial patterning making it possible for the experienced bear watcher to identify individual bears. I have come to learn the territories of the bears in the woods that I frequent most often which also helps in identifying individual bears. When I look at a bear I notice it's age. Cubs are the easiest to age as they are tiny and with their mamas. Yearling bears that have been booted from their mamas side still have a youthful face, and that rounded cub like look. By the time bears turn two they have that lanky, long-legged teenager look and huge, Mickey Mouse like ears that their head still needs to grow into. Adult bears are the most difficult to age, although senior bears often have wrinkled, furless faces. The most reliable way for Wildlife biologists to age adult bears is to take a cross-section of tooth and count the rings, much like aging a tree! Male Bears tend to have smaller ears that are set father apart than female bears' larger ears. Males' faces are also generally rounder whereas females have more elongated faces. One thing to look for when Identifying individual bears is their snout coloration. Black Bear snouts can range from totally black to quite light yellow coloring, or any variation in between. Bears often also have distinguishing facial features such as eye circles that help with their identification. Here are a few organizations that do amazing work to help Black Bears and to help people understand them. 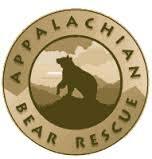 Contact them as well as your local state park, national forest, and national park, and other natural area where Black Bears live!